What began as a desire to help close friends optimize the quality of their lives has grown into a lifelong mission to give all individuals the tools they need to turn their lives around. Her breakthrough system combines social networking and life strategies for cutting edge results. 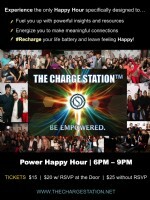 Her unique approach takes happy hour to a higher level by empowering like-minded individuals with the tools provided by guest speakers, organizations, and businesses that support self empowerment.